Numerology has been around in various forms since ancient times. Numerology is based on the philosophy that the universe as a whole is an orderly system, and that numbers reflect this orderliness. Nature in its simplest form demonstrates mathematical principles all the time. Look for example at the geometrical shape of a seashell or the unique number of genetic codes found in each form of life on this planet. This is a “stone skipping on water” article. We are not going to get profound or philosophical nor are you going to be asked to do a complex array of numerical calculations. Nevertheless, we are going to determine by using simple addition; your greyhound’s “Personal Number” based on the unique tattoos in your dog’s ears. If your greyhound is not tattooed you will be able to determine your dog’s number by his or her birth date. Every former racer receives unique tattoos in their ears in order to identify them. These usually consist of a litter registration number in the left ear. The right ear is tattooed with the birth month, birth year, and a letter designation for the “order” in which the pup is tattooed. In my greyhound Tauri’s case, his left ear is tattooed with the number 29137 and his right ear with 53A. The “53A” portion means Tauri was born in May of 1993 and he was the first pup tattooed in the litter. We are going to determine Tauri’s personal number. Calculator in hand I will total up all the numbers in Tauri’s tattoos ex: 2+9+1+3+7+5+3 = 30. I will take this number and reduce it to a single digit ex. 3 + 0 = 3. Now I will write down the alphabet so it looks like this. 1+ 3 = 4. Tauri’s personal number is 4. Feather, my other greyhound is tattooed in the left ear with 42975 and 94E in the right. Thus, her numbers total 4+2+9+7+5+9+4 = 40. Reduce it to a single digit, 4+0 = 4. The letter E = 5 (according to the chart) I add 4+5 = 9. Feather’s personal number is 9. If your dog’s number for example adds up to 40 and it is reduced to single digit of 4 but your dog’s letter is for example F which in the chart = the number 6. You would have to take those two number 4 + 6 = 10 and reduce it to 1+ 0 = 1. It is important to reduce your calculations to single digits. Now, we have our dog’s “personal number.” What does it mean? 1– The number “1” dogs are much focused individuals. They can concentrate on that squirrel in the tree better than most. They strive towards their goals (watch the dog cookie jar). They are leaders, clever, self-reliant and have a positive attitude about everything. These very active individuals would do well in dog activities like agility and lure coursing. Their apparel should include hints of ruby, yellow, orange, and gold. 2- The number “2” dogs are empathetic and adaptable. Patience and mediation are other traits. They will never be the ones to start a squabble. They enjoy harmony and peace. This is the dog you will find in the kitchen helping you cook dinner. The number 2 dogs are excellent therapy dog candidates. Their apparel should include orange and light blue. 3- The number “3” dogs are the showmen. They will find the thousands of ways of making themselves the center of attention. If a dog could write the book on creative greyhound play, this would be the one. Do not make fun of the things they do, however. Their feelings are easily hurt. 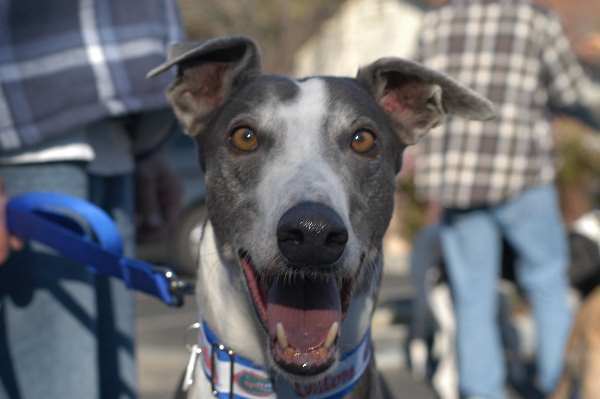 If you need a dog for a greyhound awareness day or meet and greet here is your dog. An affinity with yellow, orange, and crimson should be kept in mind when choosing their apparel. 4- The number “4” dogs are loyal. They never shirk their responsibilities as companions. They think before they act. This dog will figure out how to open the baby gate with their nose. They will sit and watch you and they perform it themselves. The 4 dogs are earthy. They enjoy digging holes in the backyard. Because of their earthy nature a 4 could be a candidate for tracking and scent retrieval work. They love to use their noses. Green and deep violet should be included in their wardrobes. 5- The number “5” dogs enjoys variety. They are adventurous and love to travel. These dogs are very sensual so beware of that lovely silk bedspread you have. You may find a “5” snuggled within its folds. A 5 dog is very curious. He or she will walk right into the middle of your craft project to get a better look. “5” dogs are excellent travelers who will be enjoyable companions on hikes and backpacking trips. If you are going on vacation bring the dog! They will be forever grateful. They would also be excellent agility and flyball candidates. Include orange and blue in their daily wear. 6- The number “6” dogs are nurturing. They love harmony and beauty. Do not pick silly themes for them in collars and leashes. Only the most dignified and regal will do. Underlying this love for luxury and beauty is a true healer of hearts. The number 6 dog is the one to snuggle when you feel like the world is your enemy. They will be the ones to adopt other family pets as their children. The number “6” dog is another therapy dog candidate. Include indigo, rose, and pink in their apparel. 7- The number “7” dog is quiet and wise. They are deep thinkers who appear aloof. They may disappear into the background. Do not let them fool you. Underlying this quiet demeanor is an inventor who thrives on the exotic and unusual. They will be the dogs that will eat the more exotic offerings you may offer them. They will actually beg for them. The number “7” dog would do well in almost any activity you would present for him to do. Violet, purple and amber gold are necessities in their wardrobe. 8- The number “8” dogs thrives on achievement. They are self-disciplined, intense and successful. They are the managers of the dog world and they will manage you quite nicely. If you forgot to feed them at a certain time or if a walk is supposed to be at 4:00 p.m. they will remind you. Don’t forgot, or the “8” dog will dog at your heels until the mission is accomplished. They will then do a doggie sigh and curl up feeling they have done their job well. The “8” dog would do very well in competition obedience as they will do the job right even if you can’t. The colors rose and violet purple are excellent additions to their wardrobes. 9- The number “9” dogs are generous. They will share their food with any and everyone including the family cat. They are idealists, artistic, all allowing and will try to blend in wherever they go. They appreciate the finer things in life and are quite creative and love to play. If they do track mud on the floor look for possible impressionistic “art.” The “9” dog will do well in any activity you may want them to try. Mix it up however; give them a variety of activities, as they are easily bored. Seek out fall colors and indigo for their apparel. Numerology is fun. The author hopes you may delve further.